Have It Your Way...That's The Thern Way! 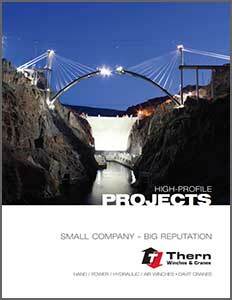 Over 60% of Thern's business is in providing custom engineered systems across all the industries they serve. Although they offer a wide variety of standard products, they understand that many projects are unique and therefore require unique solutions. Taking great pride in “over delivering” on those unique challenges, Thern can deliver custom engineered systems to meet your required specifications for your project. Their ability to provide clients with a full range of services, and custom-built solutions has made them the leader among their peers. mdi works directly with Thern's engineers to provide our clients with a product to fit their exact specifications and performance requirements. Whether you need to lift, lower, pull or position virtually anything weighing 100 lbs. 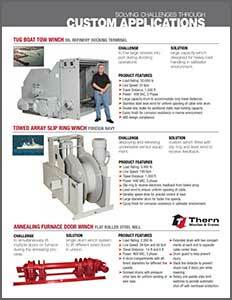 to 100,000 lbs., mdi can provide you with the perfect Thern product.